Last Saturday, we made a trip up to St Andrews Community Market. 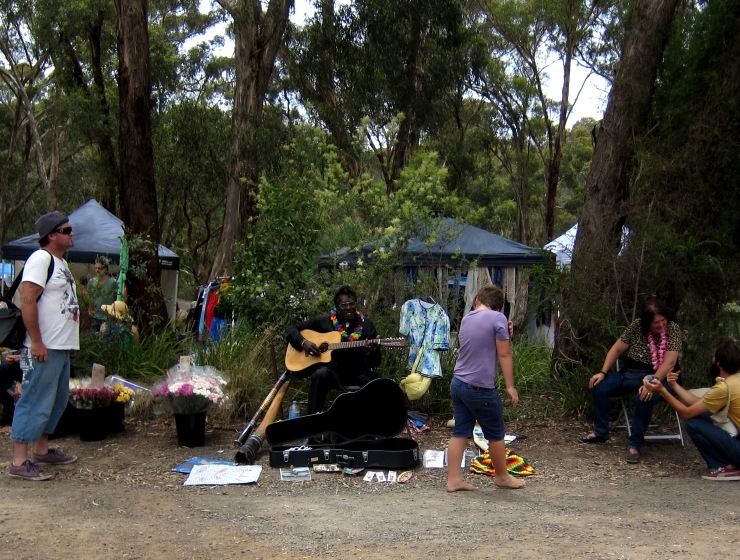 Out in the countryside, surrounded by eucalyptus trees, we browse, and shop. 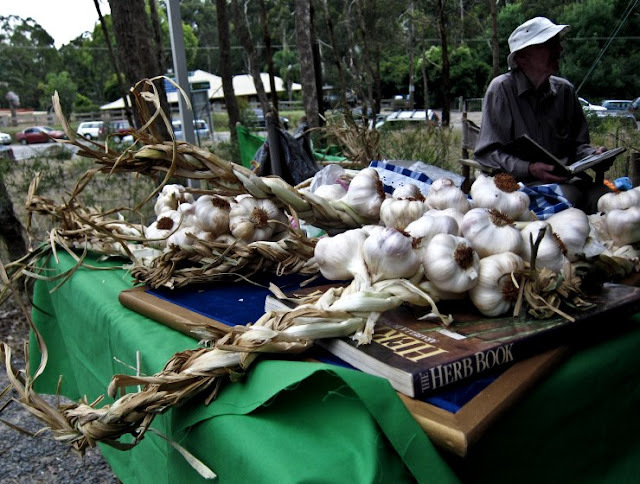 That's some good-looking garlic, right there. I persuaded my aunt to get this stevia plant. Yay! I hope it thrives in her beautiful garden. There's a bit of a hippie vibe going on in St Andrews Market, to be sure. Little baked goods, catering to a variety of dietary restrictions. He's having fun with it! I had fun browsing the various trinkets at this stall. What a great way to spend a couple of hours on a Saturday! 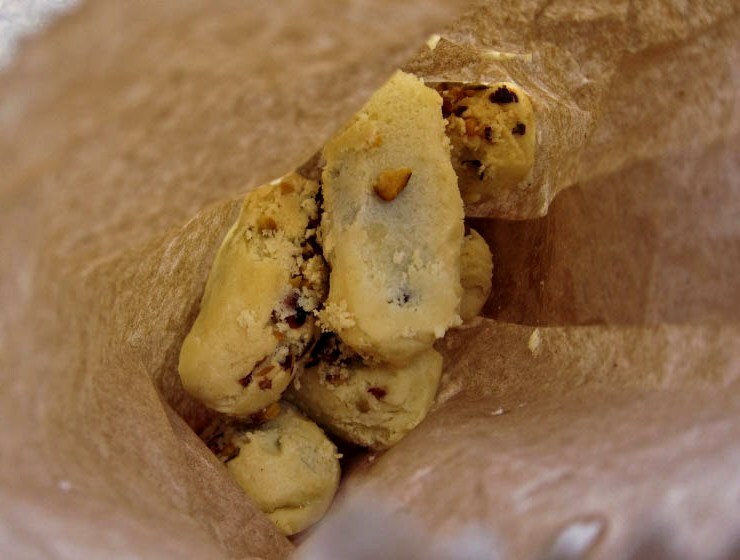 A bag of 'pistachio date wonders' - a milky, crumbly, sugary shortbread-style biscuit encasing the hidden prize of a pitted date within. Stuff that could come in handy for the kitchen, and for food photography. 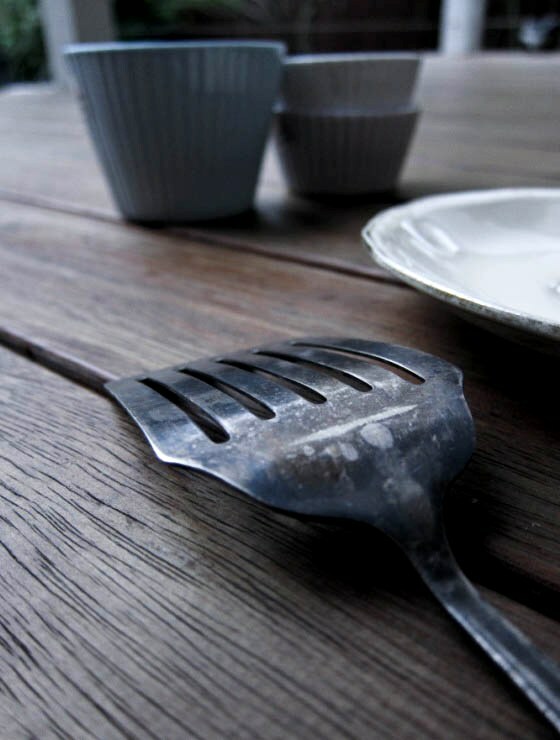 A vintage Grosvenor silver thingamajig, tarnished yet beguiling. An Alfred Meakin plate, gracefully worn out with age. Plus, modern cupcake-style ramekins by Maxwell & Williams, with the stickers still intact. And, of course, I couldn't leave without some gourmet edible goodies. A big punnet of ruby-red raspberries, ripe and bursting with juice. A tub of raw messmate honey, strained at beehive temperature, sweet and sticky with the natural goodness of pollen, propolis and enzymes. A bottle of extra virgin olive oil, tingling with the infused flavours of wild lime and blood orange. Organic raspberries, raw honey, and a citrussy olive oil. St Andrews Community Market is open every Saturday (except for fire danger days) from 8am to 2pm. Location: St Andrews town is located in the foothills of the Yarra Ranges north east of Melbourne. The market is located at the corner of Kangaroo Ground/St. Andrews and Heidelberg/Kinglake Roads. Entry price: None - free admission. What a haul! I do love a proper market. Oh, that looks like fun. And you had a lovely haul. I love a great market- can't wait to see those beautiful props turn up in your photos in the months to come. That is one big kebab that she is holding and I love the fresh and intense colour of those beautiful raspberries. Oh darn, maybe I should've gotten the pink plate too. ;) Some of the stuff I saw really were quite nicely priced compared to other shops I've been. Oh this market looks wonderful. That garlic is making me swoon! I really want to get a stevia plant but cant find one anywhere! 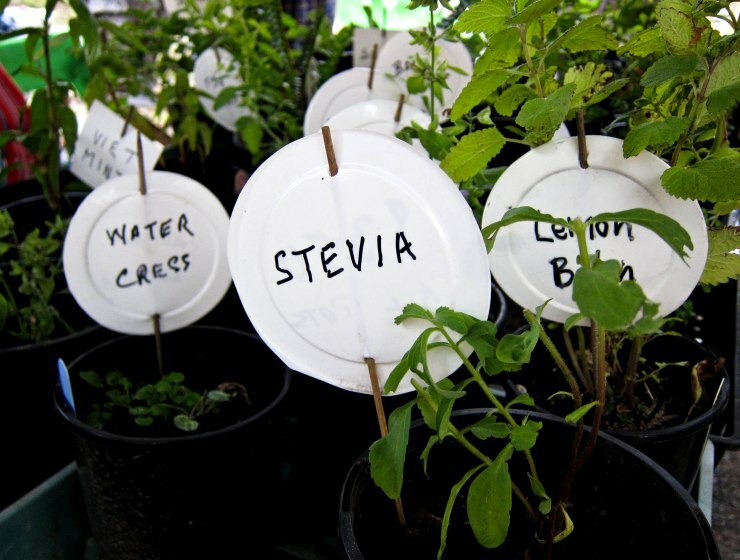 Oh, I hope you find a stevia plant soon, Anna! WIN! 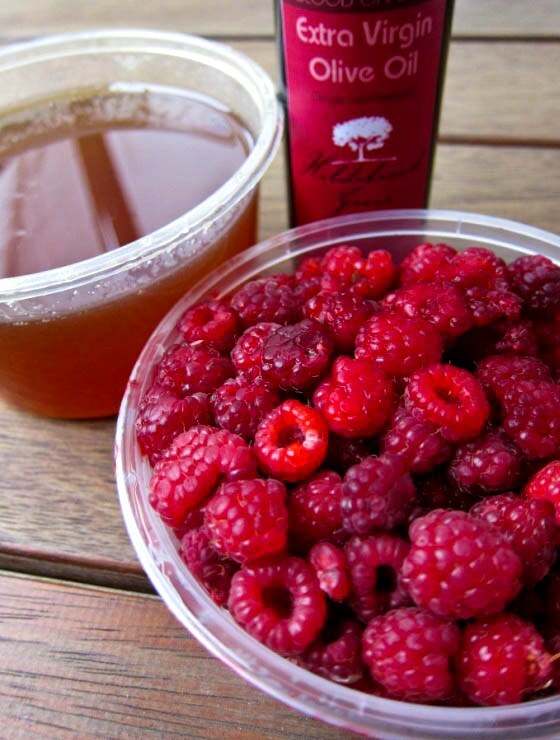 Oh my heavens, incredibly fresh and beautiful honey alongside glowign raspberries. I'm full of yearning! Yes! That honey was so very seriously delicious. Mmmm what delicious purchases! I love a good country market. I love these types of markets. 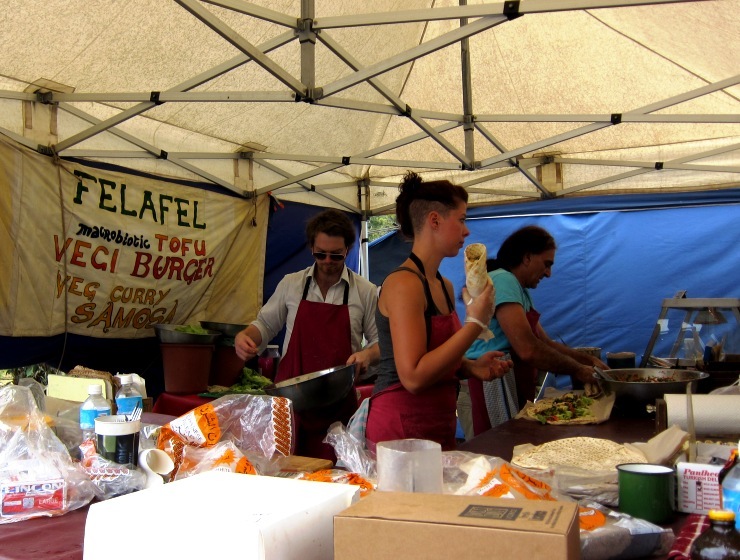 Walking distance from my place are Marrickville Organic Markets, which has a bohemian yuppie fusion vibe, hehe. One of my favourite things to do on a sunday. Nice work with those finds! Heh, I think this one has a rustic-local plus urban-hippie vibe. Kind of the same thing? Man... The fact that you found and went to such a cool community driven market with such a strong sense of homeyness tells us so much about your inquisitive and appreciative nature of all things fresh and local. To be honest, I never even heard of this place until now, thanks for sharing your wonderful experience! Your vintage food styling props look FANTASTIC! I'm so excited for you and can't wait to see you use them. They're perfect. And so are those garlics, geez louise! Haha, I can't take any credit for this, Winston. My uncle and aunt took us there... you know, the ones with the great edible garden. Maybe you can make a trip there with your friends next time! What a wonderful market, so wish we had something similar here, but I guess I can't hope for that living in rural Cornwall. Those red Turkish bowls are now something I want and I'm also very envious of your raw honey stash. On the other hand, you must have some excellent foraging opportunities in Cornwall, Choclette! I did nearly get those gorgeous Turkish bowls. I think they were about $10 for a small one so I gave it a miss as I was trying to be frugal. Those raspberries look amazing - am going to have to get myself to St Andrews. Oh my word. Vegan hummingbird cakes?! I wish I had one of those right now. Going to the market always turns out to be a wonderful experience. Those gluten-free vegan cakes did look quite enticing. I should've bought one to try! 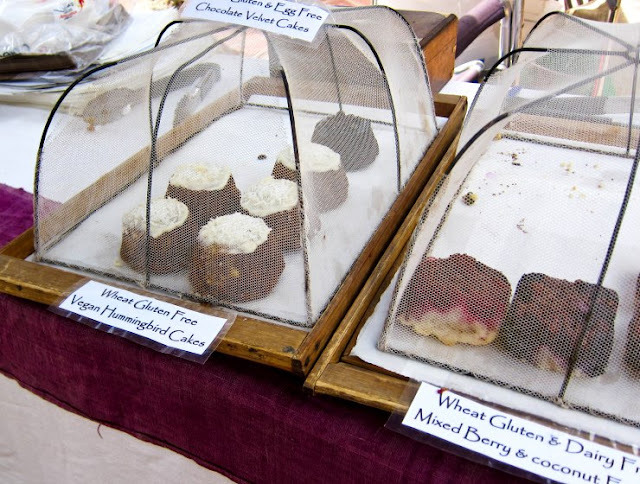 Vegan and gluten free baked goods, I must check it out! I haven't been for years, thanks for the reminder to check it out. It was my first time there. I suppose it must have changed a fair bit over the years! Thanks for sharing your gourmet & culinary finds. 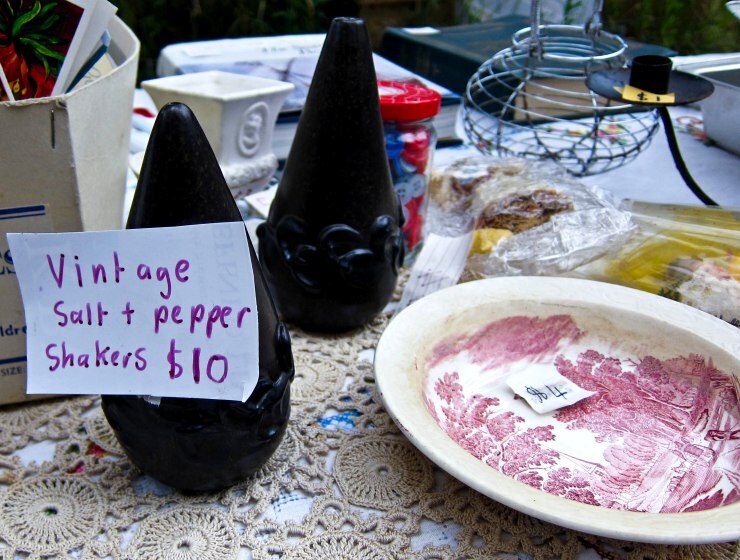 Sounds like a treasure trove of a market. Oooh! Very nice! I love markets! I'll tell my coeliac colleague about this! Some of those cakes should sit well with him! What lovely shade the Eucalyptus trees cast on the market! I've never seen cupcake-style ramekins before. I would have swept those off the table, too. Wonderful market post! Thanks Emma! It's got that laid-back vibe with a bit of attitude as you can see. ;) Yes, the ramekins are really quite cute. And a bargain too! oh what an amazing looking market! Wish we lived closer... I especially love that little pink-ish oval plate in your photo. I would have snapped that up for $4 for sure! What a great market with a definite boho vibe. 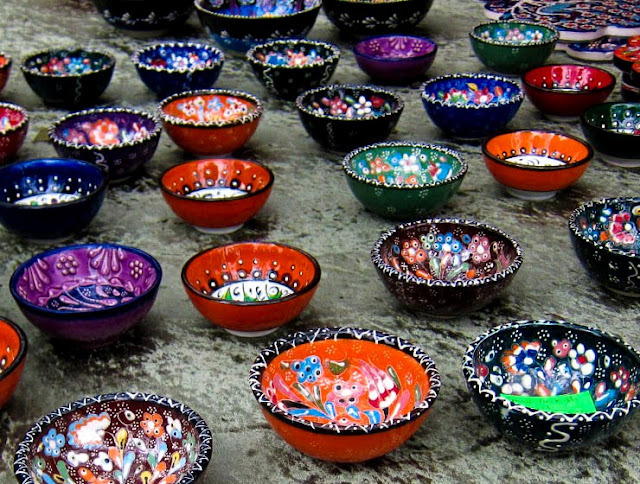 Love those Turkish bowls, too. What great finds. There is nothing more exciting than a little market like this one! Thanks so much for sharing! you have a gorgeous, relaxed blog, leaf. i'm having a great browse around. I used to enjoy hanging out in market like this...browsing around finding random things....until my kids were born! I kinda miss those days after enjoying your photos! I haven't been to St Andrews market for YEARS... which is shameful, since it's really just up the road. Must remedy that.